It seems like everyone has a band in their music collection whose name garners a look of confusion from those not familiar with their work. 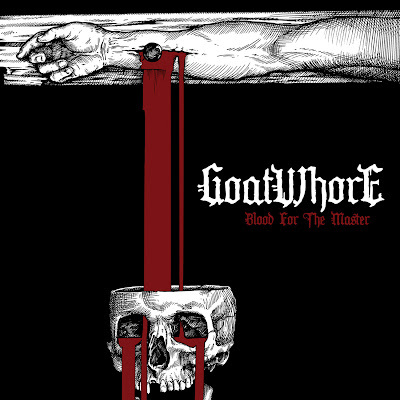 Well, Goatwhore is definitely one of those bands who receive a “deer in the headlights” look from unsuspecting people. The band heralds from New Orleans and although their music may not be as spicy as some of the Cajun food being cooked up there, it certainly has its spicy moments. The band, formed by guitarist Sammy Duet back in 1997, released their debut album The Eclipse of Ages into Black” in 2000. They caught the attention of Ozzy and Sharon Osbourne and were enlisted for Ozzfest in both 2008 and 2010. They just unleashed a new album entitled Blood for the Master on Metal Blade records. There are so many labels for music these days that you almost need a cross reference chart. The band gets categorized as blackened death metal by a lot of circles, but this album contains a lot of old school thrash elements to it. Upon first listen, you can hear bits of old school Metallica and Overkill, plus a touch of Anthrax throughout. The first track, “Collapse in Eternal Worth”, slams you right in your face. The combination of blistering riffs and the thudding drums and bass grabs you by the throat and shakes you. “When Steel and Bone Meet” is a solid track that the entire band really hits their groove on. Lead singer Louis Falgoust gives a solid vocal performance on here with his throaty, abrasive style. His vocals come up flat and non convincing on some tracks, but this one is an exception. “Parasitic Scriptures of the Sacred World” keeps the musical assault going at full speed. I think this is along the same vein as the previous track, although Louis does push his vocals in attempts for a more sinister type of growl on parts of the song. “An End of Nothing” is just sick from beginning to end and contains some insane fret work from Sammy Duet. This will be a song to bring to the live show as it will definitely get the pit going at maximum speed. This may be the strongest track on the album as the band is firing on all cylinders in its thrash assault. It’s just a shame that they don’t find this comfort zone on a consistent basis on here. A major Wayne’s World “I’m Not Worthy” knod goes to guitarist Sammy Duet. This guy gets the MVP on this album for a solid track by track performance on the axe. His solos are blistering and insane, yet he manages to keep them original and fresh. Even on some of the weaker songs, he manages to be the glue that keeps them from falling apart. Overall, it’s a good effort from the guys and shows a lot of growth by the band. It’s almost like driving a car on a trip and when you’re focused you stay in your lane. Yet, at times you may start to swerve into the other lane if you don’t pay close attention. At times this happens with the band and they come up flat. There are plenty of bright spots on the album too as the band shows growth and those tracks truly shine. This is what is needed to make this band stand out and excel ahead of others in their genre.